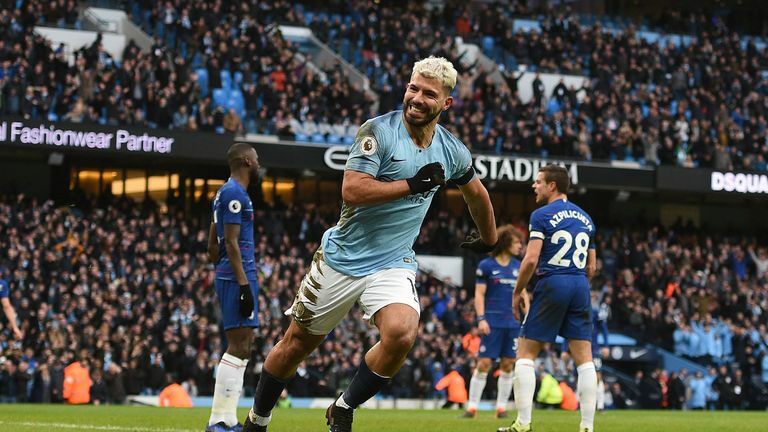 Sergio Aguero equalled a Premier League record with his hat-trick in Manchester City's 6-0 thrashing of Chelsea on Super Sunday. Aguero's treble at the Etihad Stadium was his second in a week following his heroics against Arsenal and his 11th in the Premier League - matching Alan Shearer's record in the competition. The Argentine struck his first in stunning fashion, curling a long-range shot past Kepa Arrizabalaga after Raheem Sterling had opened the scoring. He then showed his predatory instincts for his second, firing home a first-time shot on the turn following Ross Barkley's misplaced header. City went four goals up after just 25 minutes when Ilkay Gundogan struck soon after that, but Aguero was not finished, stepping up to convert his hat-trick goal from the penalty spot after Sterling was brought down by Cesar Azpilicueta. Aguero was substituted to a standing ovation before Sterling added City's sixth, his place in the history books already assured. As well as being level with Shearer for hat-tricks, Aguero is ahead of Premier League greats Robbie Fowler (nine), Thierry Henry, Harry Kane, Michael Owen (all eight and Wayne Rooney (seven). The win took Manchester City back to the top of the Premier League table while putting Aguero joint-top of the scoring charts with Liverpool's Mohamed Salah on 17.